Associate Editor at The Indicter Magazine. Editor’s Note: The opinions in this analysis are solely author Eva Bartlett’s. The actual conclusions by doctors at SWEDHR in regards to the White Helmets materials are found in this statement and its accompanied links. / Dr Lena Oske MD, The Indicter Acting Editor and member of SWEDHR Board of Directors. 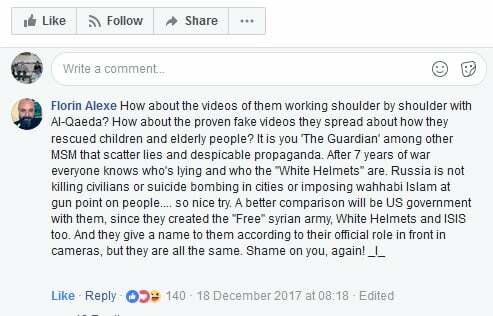 Author’s Note: In part 1, I wrote of the Guardian’s quite unoriginal Russophobic story cheering for al-Qaeda’s rescuers, the White Helmets. In this second part, I expose other (some serial) offenders, guilty of disinformation on the White Helmets, and war propaganda on Syria to a degree that Goebbels would be envious. They are further guilty of ignoring the sentiments of the overwhelming majority of Syrians who call a spade a spade, a terrorist a terrorist. Above: Photo by Eva Bartlett, July 2017, Aleppo countryside. See my photo essay on Aleppo and countryside. Also recall that the BBC was filming in an area held by extremists, including al-Qaeda and ISIS, and in December 2013 normalized the terrorist group as a “Syrian rebel” group. Robert Stuart has exposed the BBC’s lies in “Fabrication in BBC Panorama ‘Saving Syria’s Children’”. These are not one-offs, these are examples of systematic war propaganda. The article above appeared first in Eva Bartlett’s site In Gaza. It is published here in agreement with the author. 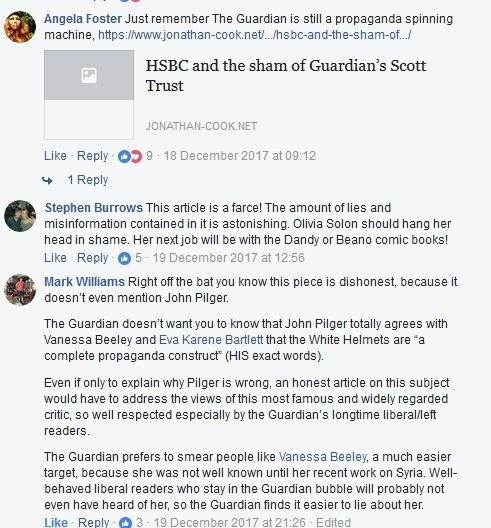 On December 18, 2017, the Guardian issued a shoddily-penned hatchet piece against British journalist Vanessa Beeley, Patrick Henningsen and his independent website 21st Century Wire, Australian professor and writer Tim Anderson, and myself. Many insightful writers have since deconstructed the lies and omissions of the article, which I will link to at the bottom of my own. Judging by the scathing comments on the Guardian’s Facebook post, the general public didn’t buy it either. The Guardian, like Channel 4 News and Snopes, whitewashes terrorism in Syria, employs non-sequitur arguments, promotes war propaganda, and simply gets the facts wrong. As the purported theme of The Guardian‘s story was the issue of rescuers in Syria, I’ll begin by talking about actual rescuers I know and worked with, in hellish circumstances in Gaza. In 2008/9, I volunteered with Palestinian medics under 22 days of relentless, indiscriminate, Israeli war plane and Apache helicopter bombings, shelling from the sea and tanks, and drone strikes. The loss of life and casualties were immense, with over 1,400 Palestinians murdered, and thousands more maimed, the vast majority civilians. Using run-down, bare-bones equipment (as actual rescuers in Syria do), Palestinian medics worked tirelessly day and night to rescue civilians. A White Helmets member. “Unnarmed and neutral”? -Who is the “we”, Solon mentions? Her mention of “we” indicates this story isn’t her own bright idea, nor independently researched and penned. Parts of the article—including the title and elements I’ll outline later in my article—seem to be lifted from others’ previous articles, but that’s copy-paste journalism for you. -It isn’t just that I believe the mainstream media narrative about the White Helmets is wrong; this narrative has been redundantly-exposed over the years. In September 2014, Canadian independent journalist Cory Morningstar investigated hidden hands behind flashy PR around the White Helmets. In April 2015, American independent journalist Rick Sterling revealed that the White Helmets had been founded by Western powers and managed by a British ex-soldier, and noted the “rescuers” role in calling for Western intervention—a No Fly Zone on Syria. (more on these articles below). This was months before Russian media began to write about the White Helmets. 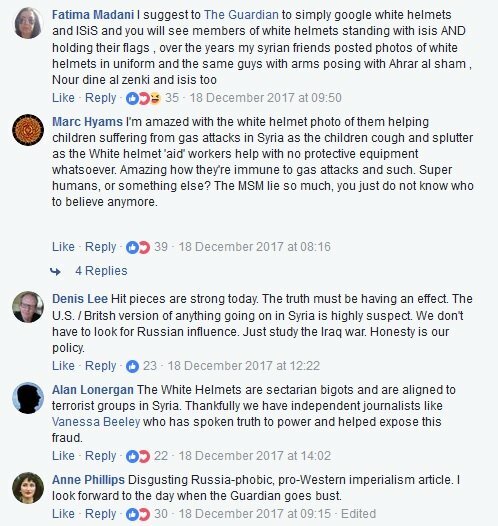 Since then, Vanessa Beeley has done the vast amount of research in greater detail, doing on-the-ground investigations in Syria, including: taking the testimonies of Syrian civilians who had (often brutal) experiences with the White Helmets; establishing that the Syrian Civil Defense exists and has existed since 1953, but are not the White Helmets—which has misappropriated this name; establishing that the international body, the International Civil Defence organisation in Geneva, does not recognize the White Helmets as the Syrian Civil Defence; establishing that men now White Helmets members looted vehicles and equipment from the Syrian Civil Defence in Aleppo—and belongings from civilians; and establishing that White Helmets shared a building in Bab Al Nairab, eastern Aleppo with al-Qaeda and were present as al-Qaeda tortured civilians, among other points. 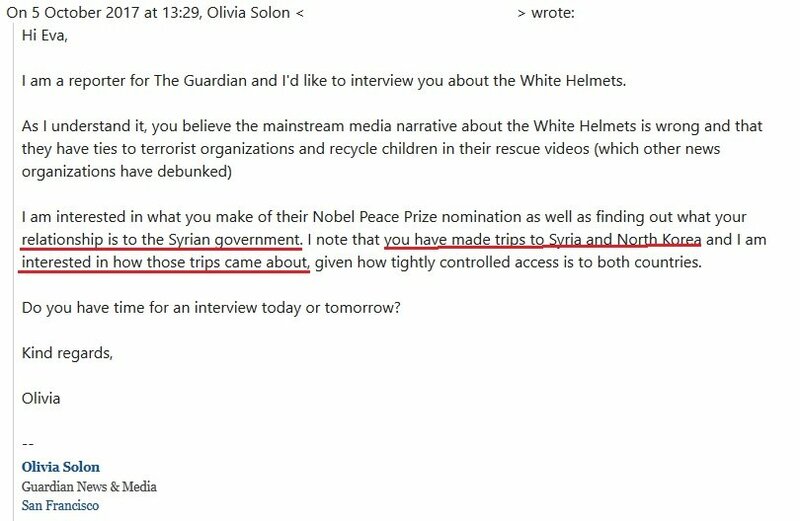 It is hard to believe that in the span of the two months between her contacting Beeley and myself that Solon, in her certainly deep investigations, has not seen this video, clearly showing uniformed White Helmets members with supporters of Saudi terrorist, Abdullah Muhaysini. Not quite “neutral” rescuers. But then, perhaps she did. She was willing to write off the presence of White Helmets members at execution scenes, standing on dead Syrian soldiers, and holding weapons, as a few bad apples sort of thing. -As to Solon’s interest in my “relationship” to the Syrian government: No, I have not received payment, gifts or other from any government. To the contrary, I’ve poured my own money into going to Syria (and have fund-raised, and also routinely received Paypal donations or support on Patreon by individuals who appreciate my work). See my article on this matter. As to how my visits to Syria and North Korea came about, this is another transparent attempt to imply that I am on the payroll of/receive other benefits from one or more of the governments in question. What following I do have began exactly one year ago, after I requested to speak in a panel at the United Nations, as the US Peace Council had done in August 2016. It is as a result of a short interaction between myself and a Norwegian journalist, which went viral, that my online audience grew. In fact, I deeply regret that what went viral was not the important content of the three other panelists and my own over twenty minutes report on conditions in Aleppo which was then still under daily bombardments and snipings by what the West deems “moderates”. However, given that so many people responded positively regarding the interaction—which dealt with lies of the corporate media and lack of sources—it seems that the public already had a sense that something was not right with corporate media’s renditions on Syria. The first person to cut and share the video clip in question (on December 10, one day following the panel) was Twitter profile @Walid970721. As I have since met him personally, I can attest he is neither Russian nor funded by the Kremlin, nor any government, and that he shared that clip out of his own belief that it was of interest. Otherwise, on December 10, before any major Russian media had, HispanTV also shared my words. Further, India-based internet media Scoop Whoop’s December 15 share garnered the most views (nearly 10.5 million by now). That Russian media later shared the clip and reported on the incident is neither my doing nor a bad thing: thank you Russian media for doing what Western corporate media always fail to do. Countering corporate media’s demonization campaigns, I’ve written on many occasions—notably including the words of Syrians within Syria—about the vast amount of support the Syrian president enjoys inside of Syria and outside. No one escorted me in a Syrian government vehicle to that embassy, by the way. I took a bus, and then walked the remaining many kilometres (the road was so clogged with vehicles going to the embassy) with Syrians en route to vote. In June 2014, a week after the elections within Syria, I traveled by public bus to Homs (once dubbed the “capital of the revolution”), where I saw Syrians celebrating the results of the election, one week after the fact, and spoke with Syrians beginning to clean up and patch up homes damaged from the terrorist occupation of their district. When I returned to Homs in December 2015, shops and restaurants had re-opened where a year and a half prior they were destroyed. People were preparing to celebrate Christmas as they could not do when terrorists ruled. In Damascus, attending a choral concert I overheard people asking one another excitedly whether “he” was here. The day prior, President Assad and the First Lady had dropped in on the pracitising choir, to their surprise and delight. And although the church was within hitting distance of mortars fired by the west’s “moderates” (and indeed that area had been repeatedly hit by mortars), the people faced that prospect in hopes of a re-visit by the President. Regarding war crimes, Syria is fighting a war against terrorism, but corporate media continues fabricating claims, and repeating those fabricated, not-investigated, accusations. For example, the repeated claim of the Syrian government starving civilians. In my on the ground investigations, I’ve revealed the truth behind starvation (and hospitals destroyed, and “last doctors”) in Aleppo, in Madaya, in al-Waer, in Old Homs (2014). In all instances, starvation and lack of medical care was solely due to terrorists—including al-Qaeda—hoarding food (and medical supplies). Vanessa Beeley has in greater depth exposed those corporate media lies regarding eastern Aleppo. Regarding convoys allegedly bombed, see my own article on one such claim, as well as award-winning investigative journalist, Gareth Porter’s article. Regarding whether the White Helmets have done any good work rescuing civilians: they are working solely in areas occupied by al-Qaeda and affiliated terrorists, so no one can prove whether they have actual done any rescue work of civilians. However, we have numerous on the ground witness testimonies to the contrary, that the White Helmets denied medical care to civilians not affiliated with terrorist groups. In September 2017, Murad Gazdiev (instrumental in his honest reporting from Aleppo during much of 2016) documented how the White Helmets headquarters in Bustan al-Qasr, Aleppo, was filled with Hell Canons (used to fire gas canister bombs on Aleppo’s civilians and infrastructure) and remnants of a bomb-making factory. The headquarters was in a school. Beeley also wrote of the White Helmets’ complicity in the massacre of civilians (including 116 children) from Foua and Kafraya in April 2017. Credentials, Please: What Is Journalism? I began reporting from on the ground in Palestine in 2007, first blogging and later publishing in various online media. In 2007, I spent 8 months in the occupied West Bank in occupied Palestine, in some of the most dangerous areas where Palestinians are routinely abused, attacked, abducted and killed by both the Israeli army and the illegal Jewish colonists. There, I began blogging, documenting the crimes in print with witness testimonies, first person interviews, my own eye-witness experiences, photos and videos. After being deported from Palestine by Israeli authorities in December 2007, in 2008 I sailed to Gaza from Cyprus and documented not only the daily Israeli assaults on unarmed male, female, elderly and child farmers and fishers, but also the effects of the brutal Israeli full siege on Gaza, Israel’s sporadic bombings and land invasions, and of course two major massacres (Dec 2008/ Jan 2009 and Nov 2012). In the 2008/2009 war against Palestinian civilians, I was on the ground in northern Gaza with rescuers—actual rescuers, no acting, no staging—under the bombings, and under heavy sniper fire. I was also on an upper floor of a media building in Gaza City that was bombed while I was in it. And otherwise, I remained in Gaza after the slaughter had ended, taking horrific testimonies, documenting Israel’s war crimes, including Israel’s: assassinations of children, widespread use of White Phosphorous on civilians; holding civilians as human shields; and targeting (and killing) of medics. See this link for a more detailed description of this documentation, with many examples, and my further documentation during the November 2012 Israeli massacre of Palestinians, as well as detailed accounts of my reporting from seven trips, on the ground, around Syria. While questioning my credentials as an investigative reporter in the Middle East, The Guardian casually assigned the story to a San Fransisco based writer specializing in fluff pieces, fashion and Russophobic analysis, who visibly has little to no understanding of what is happening on the ground in Syria. As the new corporations began taking over the press, something called ‘professional journalism’ was invented. To attract big advertisers, the new corporate press had to appear respectable, pillars of the establishment, objective, impartial, balanced. The first schools of journalism were set up, and a mythology of liberal neutrality was spun around the professional journalists. The right to freedom of expression was associated with the new media. In The Guardian’s smear piece, it is interesting that Solon employed a tactic used to denigrate the credibility of a writer by dubbing he/she merely a “blogger”. 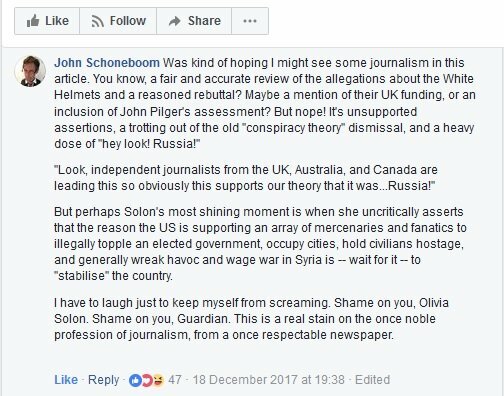 In her story, Solon used “blogger” four times, three times in reference to Vanessa Beeley (who contributes in depth articles to a variety of online media). Remind me when either Sadri or Solon was last there? Seems to be 2008 for Sadri, and never for Solon. But they are “credible” and someone like Beeley who has since her first 2016 visit to Syria has returned numerous occasions, in the country at pivotal times—like during the liberation of Aleppo, speaking with Syrian civilians from eastern areas formerly occupied by al-Qaeda and co-extremists—is not? As for bloggers, there are many insightful writers and researchers self-publishing on blogs (for example, this blog). However, that aside, it is amusing to note that Solon on her LinkedIn profile list her first skill as blogging. Is she a mere blogger? Regarding Solon’s use of the “truthers” theme, did she recycle this from an article on Wired peddled eight months ago? Her use of “truthers” is clearly to paint anyone who investigates the White Helmets as Alex Jones-esque. Is she capable of originality? Nov 4, 2016: Less than 100 metres away, the second of two mortars fired by terrorist factions less than 1 km from Castello Road on Nov. 4. The road and humanitarian corridor were targeted at least seven times that day by terrorist factions. Many of those in corporate media had retired to the bus, and donned helmets and flak jackets. I was on the road without such luxuries. Read about it here. In addition to using denigrating terms, The Guardian threw in the loaded CIA term “conspiracy theorists”. “Conspiracy theory was not much used by journalist for the decades prior to 1967, when suddenly it’s used all the time, and increasingly ever since. Guess Solon got the memo. “In the 45 years before the CIA memo came out, the phrase ‘conspiracy theory’ appeared in the Washington Post and New York Times only 50 times, or about once per year. In the 45 years after the CIA memo, the phrase appeared 2,630 times, or about once per week. In her piece for the Guardian, Solon threw in the Russia is behind everything clause. But I’m sure this is a mere coincidence. 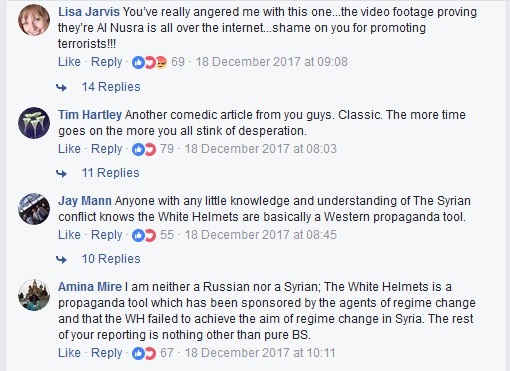 As mentioned earlier in this article, in 2014 and early 2015, long before any Russian media took notice, Cory Morningstar and Rick Sterling were already countering the official story of the White Helmets. This is where the White Helmets step in. 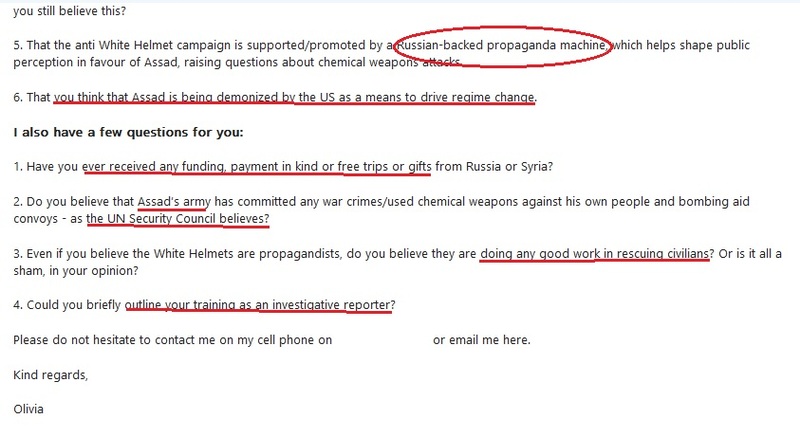 Since her initial scrutiny into the White Helmets in September 2015, by October revealing their ties to executioners in Syria, Vanessa Beeley has relentlessly pursued the organization, and the lies and propaganda around it, their funding of at least over $150 million, far more than needed for medical supplies and high-tech camera equipment. 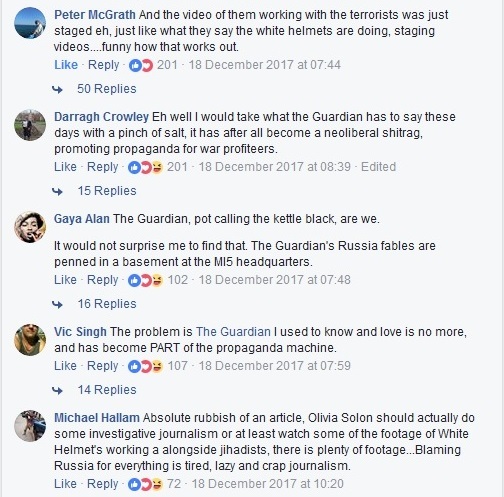 What are some things The Guardian could have investigated, had Solon’s story not been predetermined and had she approached with an honest intent to investigate the White Helmets? Solon very misguidedly chose to highlight the White Helmets’ “mannequin challenge” video, writing that the video was “stripped of its context”. What was the context? That the White Helmets, supposedly frantically, full-time rescuing civilians under the bombs, took time to make a video simulating a heroic rescue scene? The video reveals the patently obvious point that the White Helmets can clearly stage a very convincing “rescue” video. But Solon ignores this point, it doesn’t fit her factless, Russophobic story. Further, I cannot imagine any of the Palestinian rescuers I worked with wasting a moment of precious time for such an absurd video. That in spite of the White Helmets’ professed motto, “To save a life is to save all of humanity” they willingly participated in executions of civilians. But Solon wrote those extremist-affiliated White Helmets who hold weapons or stand on dead bodies or chant with al-Qaeda off as “isolated” and “rogue” actors, in spite of overwhelming evidence to the contrary. Best part? It wasn’t Russia which photographed them, it was from their own social media accounts, where they proudly displayed their allegiance to terrorists. 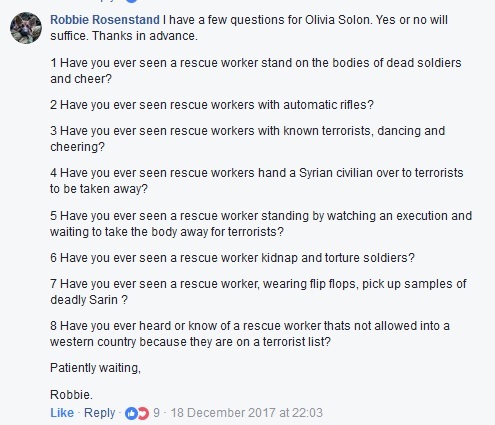 In her attempt to defend the “rogue” assertion, Solon brings in White Helmets leader, Raed Saleh, who she doesn’t mention was denied entry to the US in April 2016, and deemed by the State Department’s Mark Toner to have ties to extremists. The soldiers which Solon calls “pro-Assad fighters” are actually members of Syria’s national army. Lexicon is important, and by denigrating members of the national army, Solon is playing a very old, and once again lacking in originality, lexicon card worthy of some UN member states who violate UN protocol and in the UN call the Syrian government a “regime” (as Solon also does…) instead of government. In the UN, governments must be called by their official names. The Syrian Arab Republic, or the government of Syria. That it is not the entire UNSC which believes that Syria has committed the crimes Solon repeats, it is some members with an admitted vested interest in toppling the Syrian government. In her attempt to validate the White Helmets, and delegitimize those who question them, The Guardian article presented as fact claims that the Syrian government used chemical weapons against its people in Khan Sheikhoun in April 2017, that the White Helmets provided valuable documentation to the fact, and stated that Beeley and myself were some of the “most vocal sceptics” of the official narrative. Reasonable grounds to believe is not exactly a confirmation of evidence, it’s just a belief. “I believe it can be shown, without doubt, that the document does not provide any evidence whatsoever that the US government has concrete knowledge that the government of Syria was the source of the chemical attack in Khan Shaykhun, Syria at roughly 6 to 7 a.m. on April 4, 2017. The second article to which Solon linked was a NY Times article which called the report a “politically independent investigation”. This should make readers pause to guffaw, as the investigating mechanism includes the questionably-funded OPCW, and among those which the investigators interviewed were al-Qaeda’s rescuers. So, in fact, no, some of the most vocal and informed sceptics were neither Beeley nor myself, but MIT Professor Emeritus Theodore Postol, investigative journalist Seymour Hersh, former UK ambassador Peter Ford, and former CIA and Army intelligence officer Philip Giraldi, not exactly “fringe” voices. “Rather than deal with the difficulty of assessing what happened in Khan Sheikhoun, which is controlled by Al Qaeda’s Syrian affiliate and where information therefore should be regarded as highly suspect, Rutenberg simply assessed that the conventional wisdom in the West must be correct. Infowars is Alex Jones’ site, and Henningsen is for many years no longer affiliated. Solon followed this with another non sequitur argument about Beeley and the US Peace Council meeting with the Syrian president in 2016, a point irrelevant either to the issue of the White Helmets or the alleged chemical attacks. But irrelevance is what corporate media do best these days. The Guardian story-writer has done literally zero investigative research into the fallacies she presents as fact in her article. She’s just employed the same, predictable, tired, old CIA defamation tactics. Scott Lucas, whose allegiance to Imperialists is evident from his twitter feed, a textbook Russophobe, Iranophobe. Lucas relied on the words of terrorist-supporter, Mustafa al-Haj Youssef, for his August article on the White Helmets (the one Solon seemingly plagiarized from). Solon relied on Lucas’ smears to dismiss the work and detract from the integrity of those Solon attacked. That, and being a token professor to include in attempt at legitimacy, was Lucas’ sole function in the Guardian story. Amnesty International, the so-called human rights group which as Tony Cartalucci outlined in August 2012, is “US State Department Propaganda”, and does indeed receive money from governments and corporate-financier interests, including “convicted financial criminal” George Soros’ Open Society. It’s not just “conspiracy theorists” like Cartalucci who have written on Amnesty’s dark side. Ann Wright, a 29-year U.S. Army/Army Reserve Colonel and a 16-year U.S. Diplomat serving in numerous countries, including Afghanistan, who “resigned in 2003 in opposition to the Iraq war,” and “returned to Afghanistan in 2007 and 2010 on fact-finding missions,” has as well. Her co-author was Coleen Rowley, “a FBI special agent for almost 24 years, legal counsel to the FBI Field Office in Minneapolis from 1990 to 2003, and a whistleblower “on some of the FBI’s pre-9/11 failures.” Together, in June 2012, they wrote about “Amnesty’s Shilling for US Wars”. By now it should be clear that the intent of Solon’s December 18th story was not to address the manifold questions (facts) about the White Helmets’ ties to (inclusion of) terrorists in Syria, nor to question the heroic volunteers’ obscene amount of funding from Western sources very keen to see Syria destabilized and its government replaced. Rather, the intent was to whitewash this rescue group, and to demonize those of us highlighted, and especially to insert more Russophobia (although Russia’s military intervention in Syria is legal, unlike that of the US-led coalition, of which Solon’s UK is a part). Since our last early October communication until the long-awaited publishing of her slander-filled piece, Solon produced (or co-produced) 24 stories for the Guardian, nine of which were blame-Russia! sort of stories, including such lexicon as “Russian operatives”, “Russian interference”, “Russian trolls”, “Russian propagandists”, and “Russian bots”. Cox, who went to Syria, is probably not a Kremlin or Assad agent. She probably just listened to the voices of Syrians in Syria, like the rest of us Russian propagandists who have bothered to go (repeatedly) to Syria and speak with Syrian civilians. 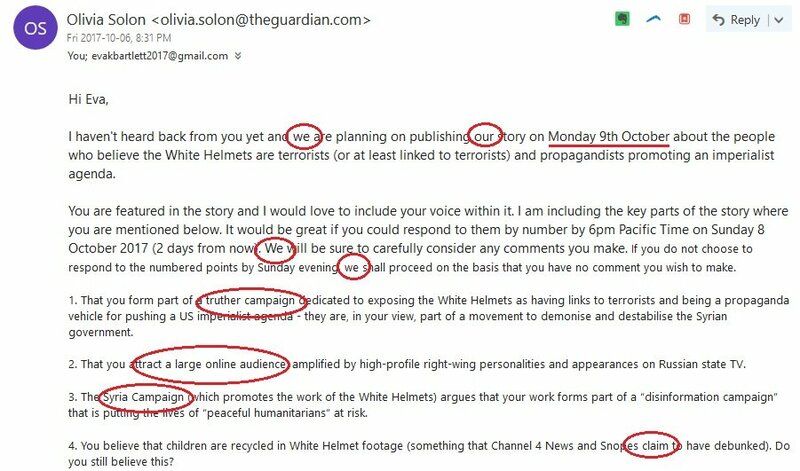 Back to the main subject of this article, the White Helmets and the Guardian’s whitewashing of their crimes, I refer now to a number of excellent articles debunking of Solon’s story. When Olivia Solon contacted me in October about her upcoming “story”, I sensed that she was intentionally using that word, instead of, for example “investigative article”, in order to shirk responsibility or accountability for the inevitable lies in her story. As it happened, that was all that her piece was: a poorly-written story filled with smears, non sequiter arguments, character assessments, and zero investigations. Just. A. Story. 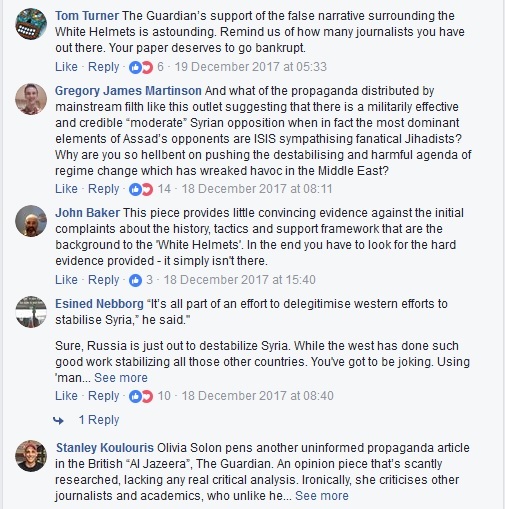 Why the Guardian’s hatchet job now, after so many investigations have exposed al-Qaeda’s rescuers, and after much of Syria has been liberated from al-Qaeda, ISIS and other “moderates”? This article by Vanessa Beeley, the prime subject of Solon’s smear story, is one indication: “White Helmets & ‘Local Councils’ – Is the UK FCO Financing Terrorism in Syria with Taxpayer Funds?” In it, Beeley has definitively exposed the UK government’s financing terrorism in Syria. The Guardian and their tech-writer Solon are indeed guilty of journalistic malpractice. At the bottom of some articles on the Guardian one can find a plea for donations, in order to support independent, investigative journalism. I heartily agree, but you won’t find that independent, investigative journalism on the Guardian. Just stories, filled with war propaganda. This is the first part of a longer article. Part II is forthcoming. Eva Bartlett is an independent writer and rights activist with extensive experience in Syria and in the Gaza Strip, where she lived a cumulative three years between 2008 – 2013. Since 2007 she has been writing from and on issues in the Middle East, mainly occupied Palestine and in recent years Syria, fighting for its existence under a foreign war of aggression. Eva has visited Syria seven times between 2014 – 2017, including visits to Aleppo, Homs, al-Waer, Madaya, al-Tall, and Damascus. Her published Syria writings, videos, photos can be found at this link. Further bio details of Eva Bartlett found here, at her site In Gaza. Photo below: March 2017, Mexico City. “International Journalism Award for International Reporting” granted by the Mexican Journalists’ Press Club (founded in 1951). Co-recipients included: John Pilger and political analyst Thierry Meyssan, among others. More photos here. Editor’s Note: The opinions in the articles above are the solely responsibility of the author, and do not necessarily represents The Indicter’s official editorial stances./ Dr Lena Oske, The Indicter Acting Editor.